First phase of Cubism. 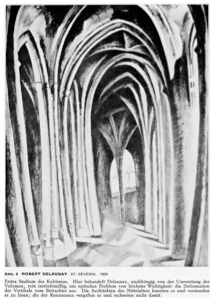 Here, quite apart from the re-evaluation of volume, Delaunay quite intuitively tackles an optical problem of the highest importance - the way in which a vertical is deformed in the vision of an observer. The architects of the Middle Ages were quite aware of this and knew how the problem could be resolved; but it was forgotten by the architects of the Renaissance, who did not take it into account. Second phase of Cubism. Representational perspective unity has been abolished. 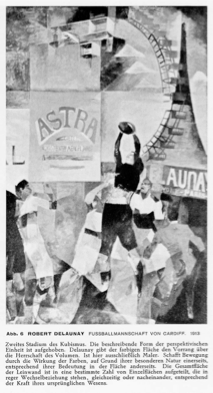 Delaunay gives the coloured surface priority over the volume which, previously, had been dominant. Here he is, exclusively, a painter. He establishes movement through the action of the colours, at once through what distinguishes each of them individually, and also through the meaning they acquire in their relations to the whole overall surface. The total surface of the canvas is divided into a definite number of particular surfaces which stand in a lively relationship one with the other, simultaneously or successively, corresponding to the power implicit in their original essence. Third phase of Cubism. Here, the mobile state of mind has taken over from the static. The form is expressed as a circle. Certainly it is still a visual, retinal effect, but could that have been otherwise in 1914? 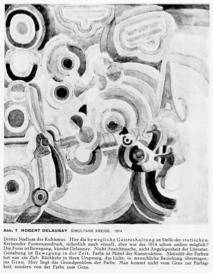 Delaunay has announced that form is movement. It is not a matter of opinion, or of literature. Plastic creation is movement in time. Colour is a means of construction. the activity of the colours has only one aim - to return to their origin, to light, which, in the human context, means to grey. That is where the basic problem of colour lies. the movement is not from grey to the colours, but from the colours to grey.